Catanduanes’ Special Education (SPED) athletes took the limelight at the Palarong Bicol Paralympics opening after winning 9 gold medals in the special events on February 5 at Metro Naga Sports Complex. Proving their worth as Palarong Pambansa qualifiers are the trio of Jayson Villaron, Lenneth Mae Tomagan, and Erika Joy I. Robles who shone in 100-meter run, standing long jump, and shot put. Villaron of Cabugao Integrated School competed in 100-meter run, standing long jump, and shot put under Partially Blind Category. 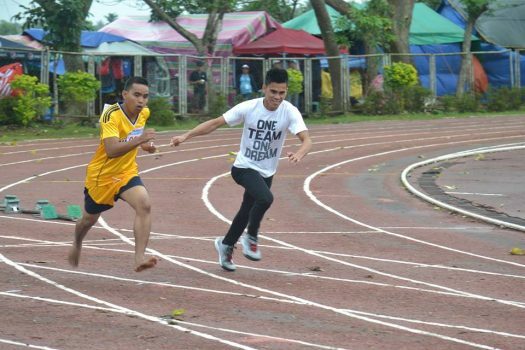 Tomagan of Viga Central Elementary School also dominated standing long jump and 100-meter run under Low Vision Category, while Robles of Bato Rural Development High School won the 100-meter run under Intellectually Disadvantaged Category. This year’s stint in Paralympics solidified the trio’s position as Bicol region’s best in Special Events Category. It can be noted that Villaron, Tomagan, and Robles represented Bicol Region in Antique last April, 2017 for the Palarong Pambansa.